There’s always a project that needs to be done around the house, and while DIY intentions are always good, sometimes calling a professional to do some carpentry is your best course of action. Whether you’re looking to add a cedar fence around your yard or build an addition to your home, our carpentry professionals can bring your concepts to life. Before getting started with any carpentry project, there are a number of considerations that must be made. Matching any new construction to your existing decor is a must, and you also want to make sure that the quality of the workmanship meets professional standards. For both businesses and homeowners, it’s important that a carpentry job be as unobtrusive as possible while acknowledging budgetary constraints. Additionally, when your Olympia carpentry project is done, all clean up should be finalized with no damage to existing structures or property. This is one of the biggest advantages of working with a professional general contractor for all of your carpentry needs. At Mike Winter General Contractor, we pride ourselves on quality workmanship that adheres to sound carpentry principles. We will work with you from start to finish to ensure that every detail of your job gets the attention and care it deserves. To put it plainly – we are only happy if you’re happy, so work with Olympia carpentry professionals who care about the product they put out. Every carpentry project starts with an idea – perhaps you would like custom shelves for an entertainment room, or maybe you want an addition on your home for a new addition to the family. Whatever the carpentry project, most people want a general idea of how much a job will cost before getting started. While a firm estimate requires details, you can simplify this process by answering a few questions about your carpentry project. What is the scope and nature of the carpentry job? Are you only looking for rough work or finishing work? If you have trouble answering some of these questions, it may be a good idea to speak with one of our Olympia carpentry experts before taking the next step. We will listen to your ideas and offer you advice on your best course of action – possibly some things you haven’t even thought of. Your carpentry job will be unique, but we have worked on a wide array of various projects, some of which are more common than others. What follows is some useful information about some of the more common carpentry jobs we’ve tackled in the Olympia area. Framing – This is a relatively broad subject as carpentry framing may be done to add a wall or two in order to create another indoor living space, or outdoors when creating a garage or entirely new structure. Quality framing requires advanced carpentry skills, so you should never take chances with anything less than a licensed professional when it comes to building the walls that hold the very roof over your head. Trim Work – This is one of those things that look easy until you actually start trying to do it yourself. Carpentry professionals have years of experience working with complex miters and other tools that help make trim work a breeze. Moldings – Installing moldings is another aspect of carpentry that looks far easier than it actually is. Molding isn’t cheap, so it makes sense to hire a carpentry professional that can ensure it’s being used to its greatest potential, without waste. Finish Carpentry – Our professional carpentry contractors can tackle any job from start to finish. Whether your building a new structure or adding a window, we can make sure the job is done in its entirety. New Construction – Have you ever wanted to add a garage or apartment to your home? A carpentry expert can turn you idea into a reality, and it all starts with a simple phone call. Cedar Fencing – Not only does cedar fencing look great, it’s also naturally resistant to bugs and rot, and surprisingly affordable. Our carpentry professionals can add a fence to your property in no time. Doors – Hanging a door isn’t easy. Call an Olympia carpentry expert to make sure it’s done right. Windows – Your windows need to seal properly to keep out the elements. Make sure they’re installed properly. Custom Shelving and Paneling – One of the marks of a skilled carpentry professional is their ability to create custom cabinets, shelves, and paneling that blend seamlessly with your decor. Wainscoting – This is yet another popular design feature that can breathe life into any space. Basements – A basement can be used for everything from storage to living space. Make sure you’re getting the most from your basement with assistance from a carpentry expert who can help you generate a wealth of ideas. Tiny Homes – These are all the rage in the Pacific Northwest. A carpentry professional can turn the spark of imagination into a place you can live a minimalist lifestyle. 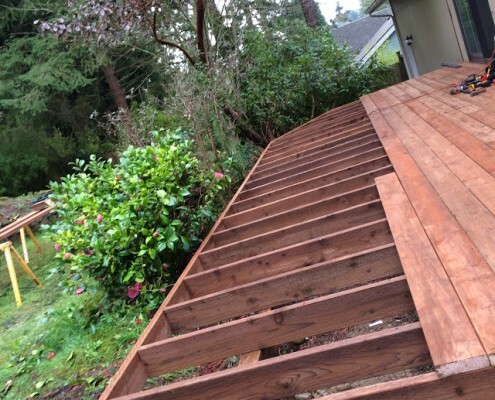 At Mike Winter General Contractor, we’ve been offering professional carpentry services to home and business owners in the Olympia area since 2008. Contact us today and let us help you with your next carpentry project.